Come see our Syrup-On-Tap! Bring your own jug and fill it up with our Vermont maple syrup that dispenses from a "tap" on the wall! 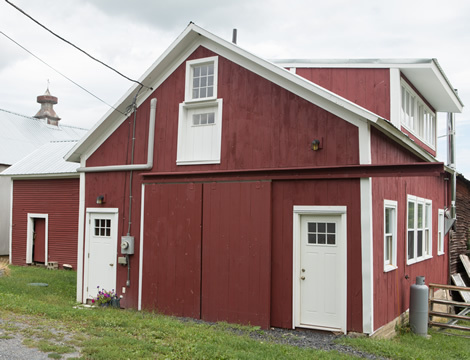 Come visit us and stay in private studio loft apartment that has recently been renovated from its former life as a 1790 hay barn. Equipped with two double beds, a full kitchen, and a bathroom. In addition to visiting our farmstand and sugarhouse, enjoy taking in walks and the scenes of the farm. In the winter months, make use of 4KM of free back country x-c ski trails (depending on snow conditions). Located in the Champlain Valley, near Middlebury College, there is also an amazing number of orchards, breweries, vineyards, and revolutionary war historic sights within 15 minutes drive. For more information or to book a stay visit our Airbnb listing. We are located on Route 74 in Shoreham, Vermont. If you have not been to this part of Vermont before, you'll enjoy a variety of scenic drives that lead you to the town of Shoreham. If you are coming from the East (Maine, New Hampshire, etc.) be sure to take Route 73 from Rochester to Brandon. Find your way to Route 22A. This route runs north and south through New York state (22) into Vermont (22A). In the town of Shoreham take Route 74 East. Take 74 East for about 1.5 miles. We are on the left. Look for our big red maple sign. Look for Route 100, which runs north and south and is considered to be the most scenic road in Vermont. In the town of Rochester take Route 73 West over Brandon Mountain to the town of Brandon. You can either continue on Route 73 to where it meets Route 22A in the town of Orwell (see above) or take Route 7 North to Middlebury. From Middlebury (see map) take Route 30 South for a few miles. In the town of Cornwall take Route 74 West. We will be on your right about 1.5 miles before the intersection of Route 22A. 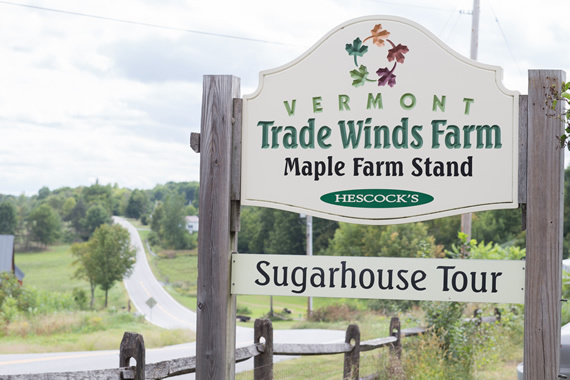 Stop by anytime to experience our new self-guided maple trail and sugarhouse tour. 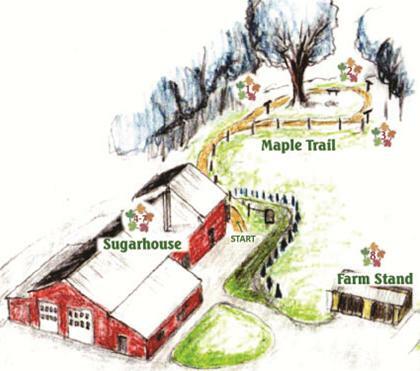 Start with a walk in the woods seeing the famous Vermont Sugar Maple tree, see how we collect the sap, and finish with a tour of the sugarhouse and free maple tasting. If you'd like a guided tour for your group please call ahead. While the maple sugaring season is a short period each spring, our high quality maple syrup at farm-direct prices is available year round. You'll find an even broader selection of syrup in decorative glass and tin at our retail shop which is open everyday, March thru December. 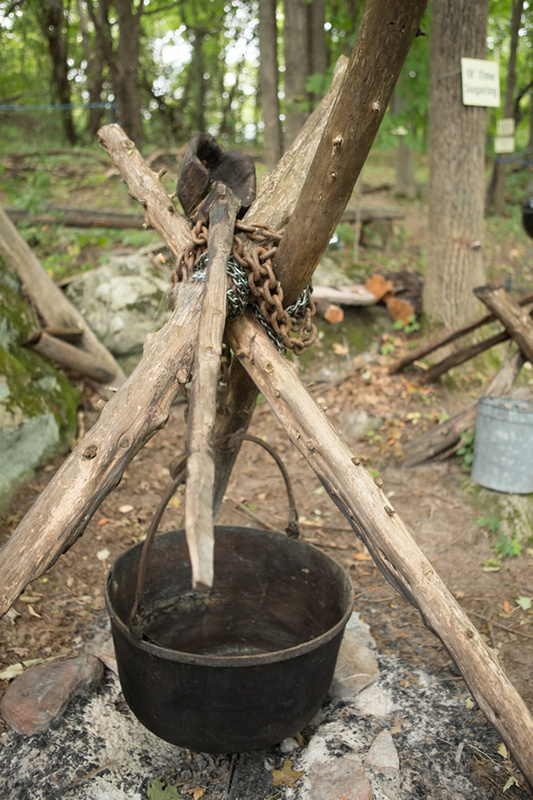 You may want to plan your trip during the sugaring season, and see Tim boiling down the sap into syrup first hand. The timing varies each year, but your best bet is the 1st week of March through the 1st week of April. If you really want to make sure the sap is running when you come, please give us a call a day or two prior to your visit.